On the East Anglian seacoast, a small theological college hangs precariously on an eroding shoreline and an equally precarious future. When the body of a student is found buried in the sand, the boy’s influential father demands that Scotland Yard investigate. Enter Adam Dalgliesh, a detective who loves poetry, a man who has known loss and discovery. The son of a parson, and having spent many happy boyhood summers at the school, Dalgliesh is the perfect candidate to look for the truth in this remote, rarified community of the faithful–and the frightened. 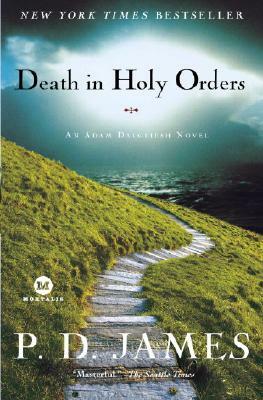 And when one death leads to another, Dalgliesh finds himself steeped in a world of good and evil, of stifled passions and hidden pasts, where someone has cause not just to commit one crime but to begin an unholy order of murder. . . .
Open the exclusive dossier at the back of this book, featuring P. D. James’ essay on penning the perfect detective novel. P.D. James is the author of sixteen previous books, most of which have been filmed for television. Before her retirement in 1979, she served in the forensics and criminal justice departments of Great Britain's Home Office, and she has been a magistrate and a governor of the BBC. The recipient of many prizes and honours, she was created Baroness James of Holland Park in 1991. In 2000 she celebrated her eightieth birthday and published her autobiography, Time to Be in Earnest.